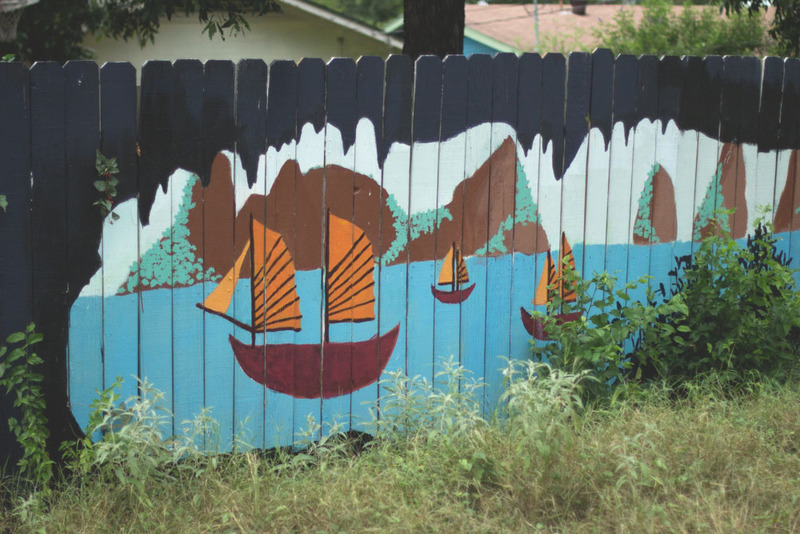 “Beauty Will Save the World” is a community mural project focussed on bringing multi-ethnic neighbors together whose houses share a long backyard fence facing Lamar Blvd, in the Georgian Acres suburb of Austin, Texas. The phrase “Beauty Will Save the World” is colorfully illustrated in multiple languages over a stretch of about 1000 feet. Rigel Thurston, community activist and founder of the mural project, explains how billboards trap people in cars, why not trap them with art? Positive community impact through art. Rigel's intention with the mural was to help bridge the gap between people who've lived here for a long time, the people who are new to the area, and the commuters in their cars zipping past on Lamar Blvd. Rigel and Polly Thurston moved into the Georgian Acres neighborhood of Austin, Texas to find themselves immersed in a multi-lingual and culturally diverse community. Their new home backs up to one of the busiest thoroughfares in Austin, Lamar Blvd. Both Polly and Rigel are artists and now having settled into their new home with their own ‘blank canvas’ of a fence out back, they set out to paint a community-inclusive mural with an uplifting message. Polly and Rigel also saw it as a way to get to know their neighbors, so they invited all of their neighbors to continue the mural along their fences. Georgian Acres is a suburban neighborhood located near 3 major Austin thoroughfares, I-35, Lamar Blvd and Highway 183. The area was once a farmland known as Fiskville in the late 1800’s; some remnants of that time still remain, including the Fiskville Cemetery and a mid-nineteenth century house. Since populated with modest sized homes, the area is relatively inexpensive and attractive to young families starting out. The idea of ‘community’ in this project is closest to the traditional definition, the people who live in and around a certain geographic location. In this case, a wide variety of cultures, ages and social standings are represented. Primarily Hispanic, there are over a dozen ethnicities and languages represented and mixed into the Georgian Acres community. The mural project created a safe space for neighbors to express themselves in their native language and helped people bridge the gap, seeing the togetherness and community that was just under the surface of the faces they frequented in Georgian Acres. Rigel explains how a car crashed into the mural a few weeks back. It's impact was dead centered on the word, 'beauty.' Lamar Blvd. is bustling 4 lane road with lots of speedy commuters. Rigel and Polly’s intention was to unite their neighborhood in an artistic expression, bringing together the highly diverse people in this community. However, this idea was not always met with ease and willingness. They found themselves carefully navigating personalities, being respectful of people’s personal boundaries and learning the delicate craft of including people at their own comfort levels. The project became about listening to what the individuals of their community wanted and designing the project around that. The positive impact of this project is the transformation in which the neighbors all know each other now. They know what languages the others speak. They might know a little more about where their neighbors are from and how they came to be here. And for all the cars passing on Lamar Blvd there is now something beautiful to look at. “Community is where an individual in isolation finds belonging. In my own life community is a goal that I am constantly moving towards, and occasionally get glimpses of its fullness. It is messy, and hard, and directly relates to my own willingness to be vulnerable with another person. Join something. Be involved. Learn more.